The multibillion dollar pet food industry has recently seen the addition of a new dietary therapy that promises to promote “thyroid health” in a can, or if you prefer, a bag. 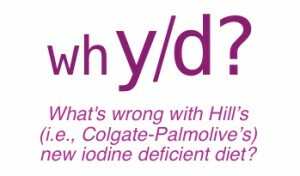 Despite the multimillion dollar advertising campaign waged by the Colgate-Palmolive subsidiary Hill’s Pet Nutrition that promotes an iodine deficient diet as a means of achieving “Thyroid Health”, thoughtful evaluation of their product yields serious concerns. The thyroid is a small bi-lobed gland located in the cervical region (i.e., neck) in all mammals. The thyroid gland gets its name from the adjacent thyroid cartilage, often referred to as the “Adam’s Apple”, which is the largest cartilage of the larynx or voice box. The thyroid cartilage resembles an ancient Greek army shield called a thyreos which, like the cartilage, also had a notch at the top for the soldier’s chin  (Figure 1). The thyroid is one of the body's endocrine glands. Endocrine glands get their name from their behavior of secreting hormones into (i.e., “endo”) the blood stream. The hormones produced by the endocrine glands circulate within the bloodstream throughout the body to regulate various bodily functions. Figure 1. Illustration of the human and feline cervical regions with emphasis on the thyroid gland, a small bi-lobed gland located in the neck in all mammals that gets its name from the adjacent thyroid cartilage. In cats the central isthmus that connects the two lobes is often vestigial resulting in the presence of two anatomically independent lobes. The thyroid gland consists of two cell types that differ based on their location and function (Figure 2). The majority of the cells within the thyroid gland are called follicular cells because they form numerous, microscopic, spherical structures called follicles. The follicular cells are responsible for the production of the thyroid hormones T3 (or triiodothyronine) and T4 (or thyroxine). The minority of cells in the thyroid are called parafollicular cells because they do not participate in the formation of thyroid follicles. The parafollicular cells produce a hormone called calcitonin that plays a relatively small role in calcium balance in the body. Figure 2. Microscopic image of the thyroid gland which reveals the spherical arrangement of the normal thyroid follicular cells surrounding the proteinaceous fluid, called the colloid that contains the precursor to the thyroid hormones T3 and T4 called thyroglobulin. The parafollicular cells that produce calcitonin are also evident in this image. Figure 3. 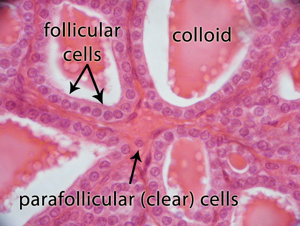 Illustration of a single thyroid follicular cell demonstrating the processes utilized to produce thyroid hormone. 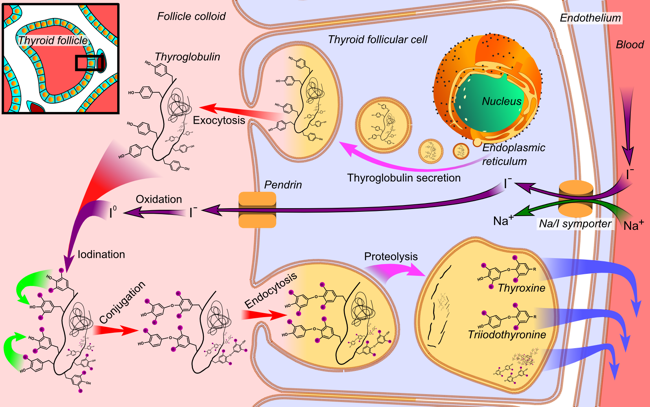 Thyroglobulin is synthesized in the endoplasmic reticulum and follows the secretory pathway to enter the colloid in the lumen of the thyroid follicle by exocytosis. Meanwhile, a sodium-iodide (Na/I) symporter pumps iodide (I-) actively into the cell. This iodide enters the follicular lumen from the cytoplasm by the transporter pendrin, in a passive manner. In the colloid, iodide (I-) is oxidized to iodine (I0) by an enzyme called thyroid peroxidase. Iodine (I0) is very reactive and iodinates the thyroglobulin at tyrosyl residues in its protein chain. In conjugation, adjacent tyrosyl residues are paired together. The entire complex re-enters the follicular cell by endocytosis. Proteolysis by various proteases liberates thyroxine and triiodothyronine molecules, which enters the blood. Hyperthyroidism is the clinical condition in which the thyroid gland produces excessive amounts of the thyroid hormones T3 and T4. Hyperthyroidism occurs in different species as the result of different mechanisms. In people, hyperthyroidism is relatively common and usually the result of an autoimmune disease called Graves’ disease named after the physician, Dr. Robert J. Graves. Graves' disease causes a diffuse enlargement, or goiter, of the entire thyroid gland . In dogs, hyperthyroidism is a relatively uncommon disease that is usually caused by a thyroid carcinoma (i.e., cancer of the thyroid gland). Figure 4. Hyperthyroid cat presented for radioiodine therapy. Note the severe weight loss and muscle wasting. The concept that iodine deficiency leads to the reduced production of thyroid hormones is well established. Indeed the history of iodine deficiency dates back to the ancient Greeks that recognized the value in treating patients with goiters (thyroid enlargements) using marine sponges. The Greeks however did not know that the thyroid enlargement they witnessed was due to the hypertrophy of normal thyroid cells in response to chronic iodine deficiency. Nor did they realize that marine sponges are an excellent source of iodine that will resolve the patient’s iodine deficiency and reverse the goiter . Iodine deficiency in patient’s with normal thyroid function results in the reduced production of thyroid hormones. This initially subclinical hypothyroidism stimulates the hypothalamus in the brain to increase production of thyrotropin releasing hormone (TRH) which in turn stimulates the increased production and release of thyroid stimulating hormone (TSH) from the pituitary gland. Figure 6. 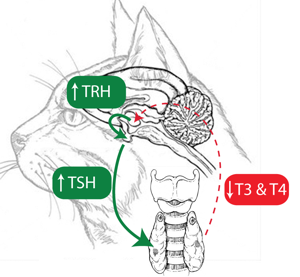 Decreased circulating T3 and T4 levels that occur in iodine deficiency reduce feedback suppression and lead to increases in TRH release from the hypothalamus which leads to increased TSH release from the pituitary. 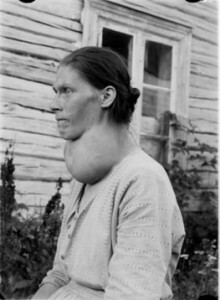 Chronically increased TSH levels result in increased thyroid size i.e., goiter. 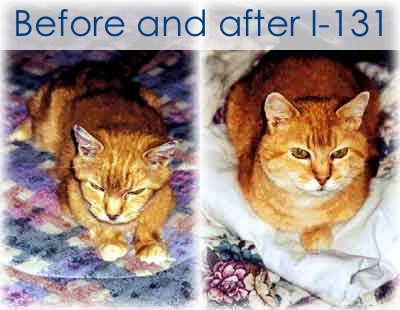 It is easy to understand how Hill’s new iodine deficient diet y/d works to lower the circulating thyroid hormone levels in hyperthyroid cats. By starving the follicular cells of the thyroid for the iodine they need to make the thyroid hormones T3 and T4, any iodine deficient diet will lower circulating levels of the these hormones. There are however, several questions about this diet that remain. 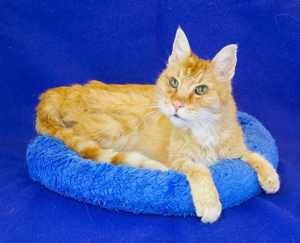 Is it safe to feed an iodine deficient diet to hyperthyroid cats? In light of our increasing awareness that iodine deficiency likely plays a role in the development of hyperthyroidism in cats, how advisable is it to intensionally feed a dramatically iodine deficient diet to cats that have already developed benign tumors of their thyroid? Will ongoing, severe iodine deficiency accelerate the growth of these benign tumors? Will severe ongoing iodine deficiency accelerate the progression from benign thyroid adenoma to malignant thyroid carcinoma ? Currently these questions remain to be answered. Minimally, we know that this diet does nothing to prevent the continued growth of the tumors responsible for hyperthyroidism in cats. Hill’s y/d includes at least two of the dietary factors that appear to contribute to the development of hyperthyroidism including overt iodine deficiency and soy isoflavins that act as goitrogens. Is it safe to feed an iodine deficient diet to cats with normal thyroid function? What about feeding y/d to cats without pre-existing thyroid disease? Many hyperthyroid cats live in multi-cat households. According to Hill’s web site, “Because iodine intake from other food sources -- treats, another pet's food, etc. -- can compromise the effectiveness of low-iodine nutrition, it's critical that you follow your veterinarian's feeding instructions carefully and feed only y/d”. Consumption of even small amounts of foods containing higher levels of iodine, including essentially all commercially available cat and dog foods and many human foods will negate the effect of y/d. This may pose a real problem to most multi-cat households in which the pet food and water resources are shared. 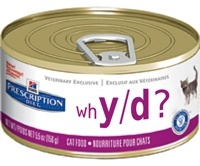 While publicly acknowledging the potential risks of feeding an iodine deficient diet to cats without established thyroid disease, privately Hill’s representatives encourage veterinarians to recommend feeding y/d to all of the cats in multi-cat households as a means of overcoming this problem. They argue that supplementing the cats without hyperthyroidism with small amounts of other foods will overcome the deficiencies of the y/d product. In light of our current knowledge of pervasive iodine deficiencies in many commercially available cat foods, this logic seems flawed. Feeding y/d to every cat in a multi-cat household, just to ensure severe iodine deficiency in a single hyperthyroid cat seems sure to accomplish only one goal, namely increasing the sale of y/d. 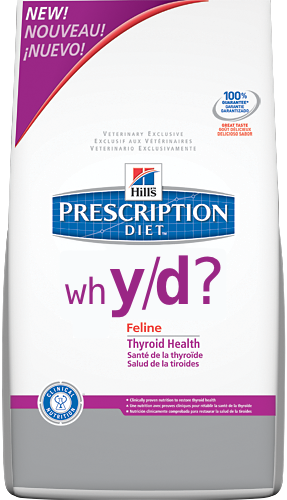 How well does Hill’s iodine deficient diet y/d work to resolve hyperthyroid cat’s thyroid hormone elevations? 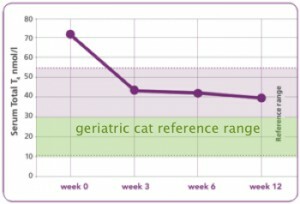 It is well established however, that geriatric cats normally have total T4 levels in the lower half of the reference range that was utilized in Hill’s studies  In Hill’s own studies, hyperthyroid cats fed exclusively y/d did not routinely achieve these levels, even after 12 weeks on the diet. Preliminary evaluation suggests that this therapy appears to be more effective in cats with mild to moderate elevations of T4 and is not as effective in cats with severe hyperthyroidism. Furthermore, as an iodine deficient diet does not prevent, and may even encourage growth of the thyroid adenomas responsible for hyperthyroidism in cats, use of an iodine deficient diet appears unlikely to successfully control the thyroid hormone elevations over time. As the thyroid adenoma(s) responsible for hyperthyroidism continue to grow, the number of autonomously functional thyroid cells increases and their combined efficiency for extracting iodine from the blood stream with which to make thyroid hormones increases.